The ACT Annual Dinner is the premier networking event in the corporate finance calendar. Taking place in the elegant surroundings of the Great Room at the Grosvenor House Hotel, this event provides you with a fantastic opportunity to network with your peers whilst enjoying a superb 3-course meal, fine wine and entertainment in one of the most prestigious venues in London. This is a sell-out event every year, so make sure to book your tables soon – we still have a limited amount of tables left at the early bird rate, so click on the link below to book! Exclusive rates for bedrooms are available for guests attending this event. Please note that rates include VAT and exclude breakfast and are offered subject to availability at the time of booking. For further information, contact our Reservations Team on 0207 012 7629, please quote; Cluster Code EG4 to obtain this special rate. Alternatively log onto www.londongrosvenorhouse.com, and complete EG4 in the Corporate / Promotional code box, to obtain this special rate. The ACT supports a charity every year, by giving it the opportunity to raise funds at the ACT Annual Dinner and at the Annual Conference, 10% of which is given to the ACT Educational Trust with the rest going to the charity. The ACT Educational Trust uses the funds to grant bursaries to ACT students. In 2019 the ACT continues to support Hand in Hand International, who specialises in grassroots entrepreneurship in developing countries, helping those living in poverty to launch enterprises, boost their income and find a sustainable way out of poverty for themselves and their families. Their proven 4-step job creation model encompasses a range of business training, where their trainees learn the basics of entrepreneurship and gain financial literacy before gaining access to micro-loans to grow the businesses they establish. They then help connect the entrepreneurs with larger markets to develop their businesses even further. For instance, they are linking 1400 farmers in Baringo County, Kenya into a honey value chain, to be suppliers for African Beekeepers ltd, a leading private honey manufacturer. To date, their business training and microloans have helped to set up over 2 million businesses and create over 3 million new jobs for some of the world's poorest communities, improving the lives of over 11 million people - mainly children - as a result. Ninety seven percent (97%) of their jobs created are still existing 3 years on from their creation – demonstrating the robustness and sustainability of their model. Hand in Hand has a particular focus on female entrepreneurs: not only is female empowerment an end in its own right, but research has indicated that for every dollar they earn, women spend 90 cents on their families and communities, whereas men only spend 40 cents. This means that additional income for women helps improve the living standards and well-being of wider society, with more money being spent on things such as children’s education, more nutritious food and better health care. This is why 90% of their trainees are women. For an idea of the impact, that our partnership has, watch their video. Take a look at a selection of photos from last year's event. 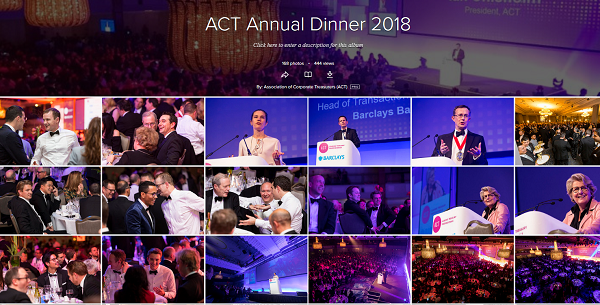 On Wednesday 14 November, over 1,500 treasury and finance peers gathered to enjoy an evening of fine dining, entertainment and networking at this year's ACT Annual Dinner. Here’s a selection of the event photos from the evening for you to enjoy. You may even spot yourself! A big thank you to our guests for making the event a huge success. The generous support we received on the night helped us raise over £60,000 for our appointed Charity of the Year, Hand in Hand. This money will go a long way in helping those living in poverty to launch enterprises, boost their income and find a sustainable way out of poverty for themselves and their families. The diminutive Dane has been wowing audiences with her caustic wit since her student days, when she appeared in Cambridge Footlights reviews. She has taken over the QI presenter’s chair following Stephen Fry’s departure. She also co-hosts the new Great British Bake Off on Channel 4. Having firmly established her presenting laurels with Radio 4’s Excess Baggage and The News Quiz, Sandi divides her time between travelling, writing and performing. She is also a regular on I’m Sorry I Haven’t A Clue. TV credits include Mock the Week and the first ever episode of Have I Got News For You. Sandi has written a number of children’s books, starting with Tales From The Norse’s Mouth. 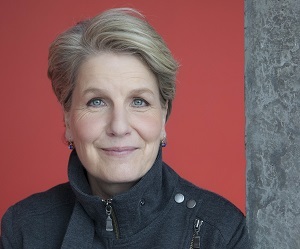 She has also been successful with non-fiction, including Island Race - an account of her voyage around the coast of Great Britain with her friend and former Beirut hostage John McCarthy, and The Tricky Art of Co-Existing, a guide to behaving decently in an indecent world. Sandi has been named Channel 4 Political Humourist of the Year, and Radio Broadcaster of the Year by the Press Guild. Be the first to hear of treasury news, regulatory change, plus receive discounts on ACT event tickets and more.. Registered address: The Association of Corporate Treasurers, 69 Leadenhall Street, London EC3A 2BG.